Although it’s not you marking the changes on your credit file every time you miss a payment or apply for a loan, it is your responsibility to ensure that your credit report is error-free. Many individuals miss out on loans they would qualify for because of mistakes on their credit reports in Canada every year. If you don’t want to join that group then it’s important that you check your credit score at least once a year to ensure that everything on it is accurate. If you are planning on making a mortgage or car loan application in the near future then it is especially important for you to ensure that the information on your credit report is correct. Mortgages specifically have become tougher to obtain in Canada, therefore, you need to avoid any unwanted headaches. Most lending institutions (from banks to credit card providers) will pull your credit score before handing you credit, so please ensure that your credit report is error-free. What can you do if your credit report contains an error? If there exists an error on your credit report then you need to contact the credit bureaus immediately. An error on your credit file might be just that – an error, and it might be fairly easy to correct – however, it may also point to a larger problem. You could be a victim of identity theft, which is a far greater problem. So again, contacting the credit bureaus is vital. 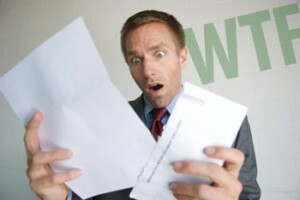 Check your credit report for errors regularly so you’re not caught with any unwanted surprises! The strategy here is simple: if you have pulled your credit score and have spotted one or more mistakes, contact the credit bureaus immediately to have them corrected. The credit bureaus will follow up with an investigation and may request some information from you, such as a written statement for example. It is important that you keep a record of all communication here in case you have to show your efforts to correct these mistakes to a future lender or employer. You should also inform the lender or company that issued the inaccurate information together with any documents that can be used to prove your case. Remember, ensuring that your credit file is accurate is your responsibility. You may have to chase after the credit bureaus and the companies that made the mistakes, but it is important that you do so that qualification for future loan applications goes through smoothly.